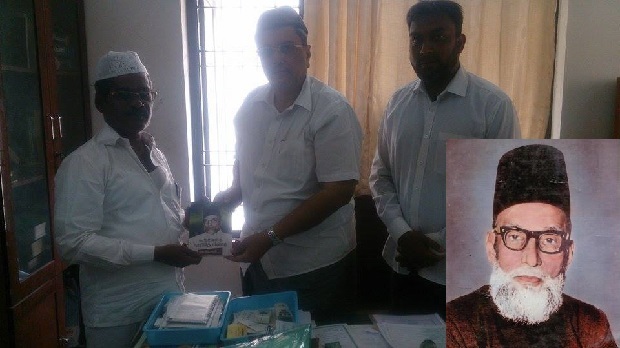 Chennai: Dawood Mia Khan Sahib (Grand son of late Quaide-Milleth Muhammed Ismail Sahib) meets AIMIM state president Iqbal Sahib, and former treasurer and active party member Mr. Zedaan Masood Khan in Chennai and presented late Quaide-Milleth Sahib Biography and had a fruitful discussion for forthcoming assembly elections and to reunite in Tamil Nadu. Quaide Milleth Alhaj Muhammed Ismail Sahib was born in 1896 at Pettai, Tirunelveli, bloomed on the horizon of Tamil Nadu public life and the fragrance of his service blossomed across the whole India, even crossing India. Ismail Sahib was ignited into India’s freedom struggle by Mahatma Gandhi. He shared the political stage with stalwarts like Shri. Rajagopalachari and Dr. C.N. Annadurai. He was an exemplary legislator for many years. He was an activist in “Khilafath Movement”. His participation in the fund mobilization for Jamia Millia by Dr. Zakir Hussain exemplified his magnanimity. The unfortunate events of 1947 had created a sense of insecurity in the minds of minority Muslims. The Muslim minority in India had no hopes of peaceful and honourable existence. At that time of darkness and desperation there appeared a ray of hope from a remote corner and shone with all its brilliance with such sustained velocity and effulgence that removed doubts from the Muslims of India. The light, in course of time, was acclaimed as the only source of guidance to the Indian minorities. Janab Muhammed Ismail Sahib became the Quaide-Milleth, the sole and undisputed leader of the community. QAIDE MILLETH MUHAMMED ISMAIL SAHIB was Founder President of Indian Union Muslim League (IUML: 1948-1972), Member of Constituent assembly, Rajya Sabha Member during 1952 – 1958 and Member of Lok Sabha for 3rd, 4th and 5th. This meeting of Dawood Mia Khan Sahib with AIMIM is seen as an important steps towards the forthcoming elections and planning to unite all muslims community.